I'm asking for some first hand experience. Years ago I had a "C. Sharps" in 45-70 which I loaded for and it shot very well with the Lyman Postell bullet. I had to part with the rifle after losing my job. My nephew is sending me his "Shiloh Sharps" 45-70 to work up loads for.. I remember that it had a chamber shorter than mine and we were unable to seat the Postell loaded rounds( I used 62.5 gr Goex Cartridge grade, compressed with fiber wad). I furnished him with several cast bullets to use and he said that even with drop tube and compression die he was not able to seat it deeply enough to use 60 gr of 2F. I was thinking of trying a lighter, shorter bullet, but thought that someone surely must have already "cracked that nut". I guess I could do a pound or chamber cast, but I was trying to explore some choices from your success. Thanks in advance for looking and sharing. I think CSA has changed specs on their reamers a bit, but generally their chambers are a bit more generous than Shiloh's. IE a case fired in the CSA won't chamber in the Shiloh without full length resizing. But the last CSA 40-65 we got won't take a case the has been fired in any other rifle. You may want to check the diameters on that postel bullet, it may be casting to large to fit the bore of the shiloh, or if casting from soft lead, the nose might be getting squished a bit in the lubrisizer. Shorter lighter bullet the Saeco 645 is a good bullet. There are molds available that are tapered so that you don't need to seat the bullet so deep in the case. I'm shooting a Leeth/Gordon bullet that only seats about .250 deep. The Postel is around .600 deep IIRC. This is in a Pedersoli Sharps. My C. Sharps rifles have always had fatter chambers with some freebore. I've always found it easier to get good accuracy from my Shiloh rifles. All of my .45 cal Shiloh rifles shoot the Buffalo Arms 458535M bullet very well. This bullet will sit with all grease grooves covered in a Shiloh chamber. You won't fit a huge amount of Swiss 1.5 in the case using a .45-70, but it will shoot quite accurately to silhouette distances. Shiloh chambers ( unless ordered with a custom chamber or their 7 degree leade ) are all the same configuration. 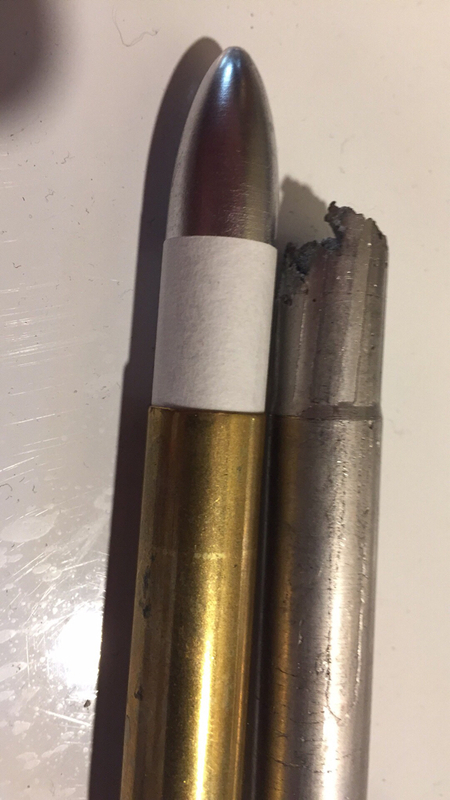 0.050" freebore and a 2.5 degree ( per side ) leade. thanks to all for your insight, it is very helpful.
. My c sharps has no freebore. I have to seat grease groove bullets with no lube grooves showing. Here is a chamber cast of my rifle. Not sure when they did it but they have switched their Reamer design as I have seen some with freebore. Interesting. That's quite different than mine for sure. My C. Sharps rifles had around 0.1" freebore. Mojave Desert Palmdale, Ca. U.S.A. I have seen many Lyman Postel moulds that throw a fat out of round nose(.449+). OP-What's the nose dia on yours? I recently asked C-Sharps about the 45-70 chamber and they replied it was SAAMI spec. They haven't replied on the 40-65 chamber yet. The reason I asked was I am considering having them build me a high wall.